We’ve made some changes to the Inventory feature and renamed it Source analysis. See how to use it here. In this first iteration for our SharePoint inventory, you can quickly select your On-Premises SharePoint, or another tenant, to simulate a migration to SharePoint 2013, SharePoint 2016, or Office 365. 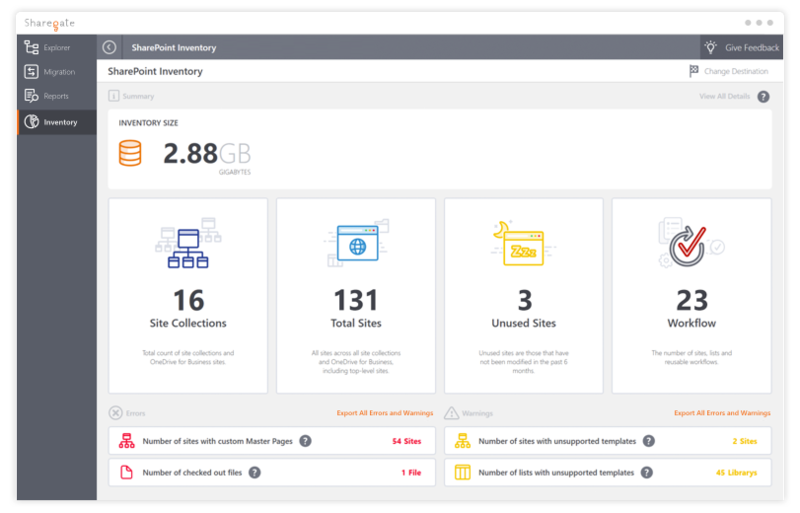 After scanning your environment, Sharegate will give you a quick summary of what you have, as well as list potential warnings and errors you might encounter for the desired destination. With the release of the 5.13.2 update in August 2016, users can now export a spreadsheet containing additional information on the errors flagged during the Inventory scan. This spreadsheet contains the error or warning types, titles and locations as well as details on the issues themselves. Each one also links to a help page containing more information on how to fix these potential problems. To export your own, just click the "Export All Errors and Warnings" button, below the four site and workflow Inventory cards. This is perfect if you’re trying to get an idea of how complicated or large your migration will be. A great way to estimate the overall effort, and it’s available without limitations in the Trial version of Sharegate. The Explorer is a way to quickly navigate your environment and manage it. We’ve listened to your feedback, and decided to bring your most popular actions front and center in the Quick Actions panel on the right. Now you can easily drill down, and just as quickly run a Permissions Matrix Report to know who has access to what. The challenge when migrating to Office 365 is speed. Thankfully, Sharegate has the Insane Mode, backed by a strong collaboration with our friends at Microsoft. In this release, we worked together to provide a free and default Azure Container so you don’t have to worry about it anymore. Sharegate will now always use the Insane Mode by default with an associated storage account for it. Focus on your migration, we’ll make sure it gets there as fast as possible. We take a lot to heart, but above all is Customer Satisfaction. We take this so seriously, in fact, that we’ve now included a functionality that lets our clients send us feedback directly through the app. Have a suggestion? Our Product Team can handle it! One of the biggest advantages of owning Sharegate is that it's valuable every day, even after your migration. You can use our new File Share or SharePoint inventory for migration assessment. Perform a SharePoint Migration from one version to another, or bring File Shares to SharePoint with all the flexibility and power expected from your favorite tool. With no GB limits, continue to use it to copy or restructure your SharePoint as desired. Whether it’s promoting a subsite to Site collection, or merging two sites together, the possibilities are endless. Use the Explorer and Reports to know exactly what your environment contains. Take quick action on what you find within your reports to stay compliant and enforce your governance plan. Empowers users with insight into what’s going on within their SharePoint Online on Office 365, and helps follow best practices at the same time. To help you get the most out of Sharegate, we've been working hard at merging the currently separated Sharegate Migration app into a single one, Sharegate. Soon, you'll be able to jump from the Explorer to a Migration, follow up with Reports and, from there, decide to migrate one of the libraries with its Workflows to a new location. Stay tuned, it’s only going to get better from here.